The other day I went to my eye doctor and had my eyes examined. Happily, my prescription strength actually decreased – mostly because I started doing the things in this book. So it was time to pick out some new frames. However, picking out new frames was a bit of a frustrating experience. The first problem I had is that all the frames today look so similar. Sure there are a few different shapes and materials, but not one pair of frames really stood out from the rest; they all blended together in a blur (and that wasn’t just because I’m nearsighted!). Some frames were rectangular and some were kind of round, and the supposed retro glasses were just plain ugly and had no character. It turns out that the had nothing I wanted to wear. Even the very expensive designer frames had the same generic looks, with the addition of the huge designer logo on every single frame. Needless to say, I left the opthamologist with nothing more than a copy of my prescription. The chain eyeglass place at the mall was the same. So I ended up ordering a new pair of retro frames. 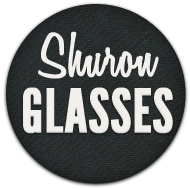 My initial choices were another pair of Shurons, some vintage ArtCraft frames, or a pair of vintage American Optical frames. I also considered the Moscot Lemtosh and the Tart Arnel, but I found out that it’s hard to find these in a size that looks good on me (also, they tend to cost more than I wanted to spend.) I love all kinds of retro glasses, and something I’ve been wanting for a couple of years now has been a pair of Ray-Ban Wayfarers (as regular glasses). Since I already have three pairs of Shurons, I finally decided on the Ray-Bans. I like the glasses I got because they have personality, uniqueness, and they’re high-quality. Retro eyeglasses are a bit herder to get, but in my opinion the effort is worth it!